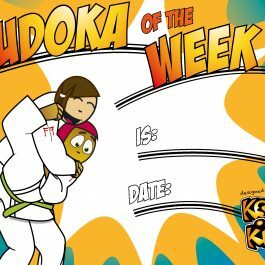 We talk to eleven judo coaches to find out how they use the Koka Kids Coach Resources to promote judo, reward attendance and keep kids interested in judo at their dojo. Peter Gardiner (6th Dan) has spent a life-time in judo. He has not only built Sportif Judo into a succesful club but also into a growing business educating coaches in seminars around the world. If you haven’t been to the Sportif International that Peter organises annually, do so sooner rather than later. It’s one of the best tournaments of the year. 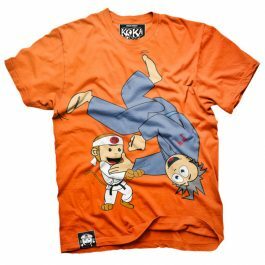 How Peter Uses Koka Kids? 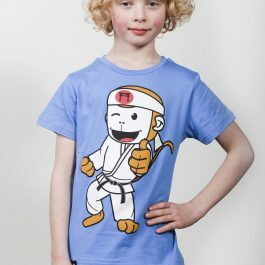 “Koka kids is used in several ways at Sportif. Firstly kids are encouraged to read the magazine at home and we ask questions during class. 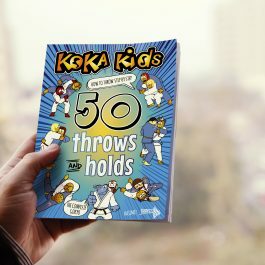 “Who can tell me the superstar player in Koka Kids?”, or “What was your fave throw in Koka Kids?” Or we use it in the lead up to gradings. We have laminated pages from the magazines and have the kids point to throws, name throw or demonstrate throws. 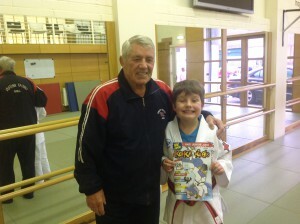 10th Dan George Kerr CBE has been a great supporter of the Koka Kids magazine since it’s first issue. Dave Edmonds (MSc. BA. 5th Dan) is an EJU Level 6 Master Coach and that speaks volumes. 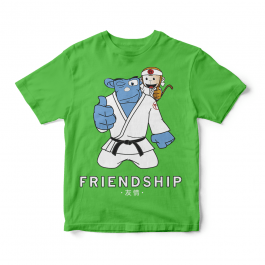 His judo knowledge is vast and varied and guaranteed to draw you into conversation! Dave, along with his team of qualified coaches including Senior Coach Tom Haynes (2nd Dan) teaches judo in over 50 schools throughout the Thames Valley. 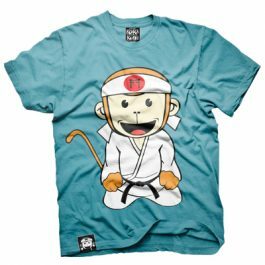 During any term the Iinkai team will bring judo to over 1,000 young people. That is quite something! How Iinkai Uses Koka Kids? “We use Koka Kids magazines and banners. The children love seeing themselves in the magazines. 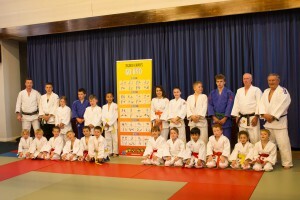 We include photographs and the names of the judoka who have done particularly well at Iinkai gradings or training days. The children really enjoy seeing the Master Classes in the magazine. They love it when they realise that a technique they are learning is used by the world’s elite competitors. 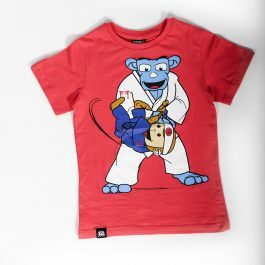 It helps to show the children who are the best judoka on the planet. It gets them interested in the sport. Richard Jones is having a great year. Irfon judo club was voted Club of the Year (silver award) by British Judo and Natalie Powell, who started with Richard when she was younger, has just won a bronze medal at the Paris Grand Slam. Richard’s approach to judo is a dynamic one, with lots of ideas keeping his young judoka wanting more. 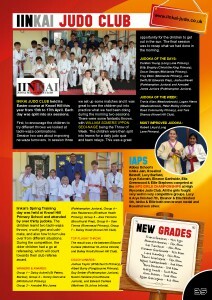 Irfon Judo Club is on the up! Stephen Mc Cluskey has represented Ireland all over the world as one of the country’s leading competitors – winning the World School’s title. 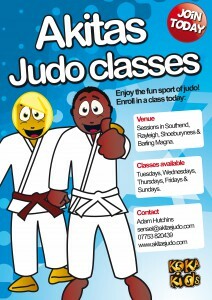 Now passionate about coaching, Stephen leads The Judo Academy. It is thriving! 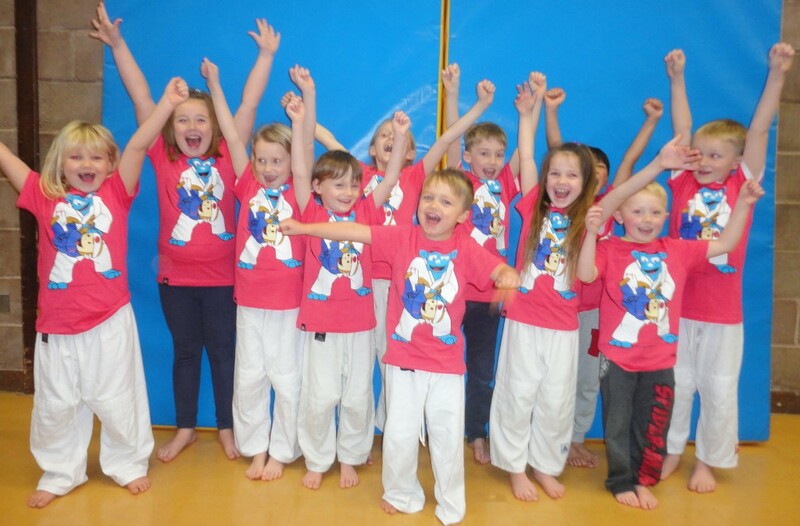 Over 450 children participate in classes weekly taught by Stephen and Senior Coach Ann Marie McCluskey and their team. 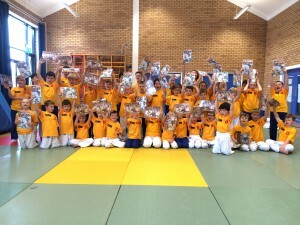 The Judo Academy judoka with their summer reading material – get them interested in judo! Uses the Magazine To Advertise What is Coming Up to Members. Most of you will probably know Larry Stevenson – the competitor and the coach with a big personality but did you know that Larry also represented GB at the first World Sumo Championships? Larry is the head coach at Europe’s oldest dojo The Budokwai in charge of Judo Games, Mini, Midi and Junior Judo classes where needless to say the kids adore him. Budokwai use a page to advertise their upcoming events. 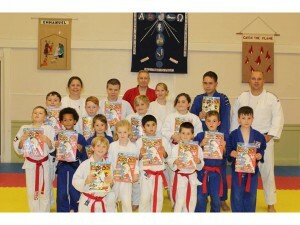 Uses the Magazine To Help Kids Understand They are part of a wider judo world. 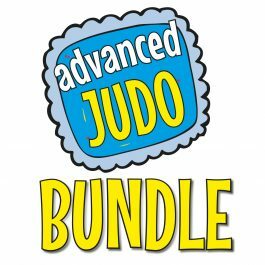 Judoknight was founded in 2008 by Janice Knight, a former British International and Commonwealth champion, who had the vision to “Bring Judo to the community, making it a mix of sport, fitness and fun for everyone. 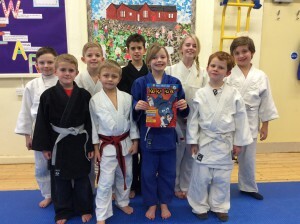 Judoknight now works in 30 primary and secondary schools around Cumbria – the vision is a reality. 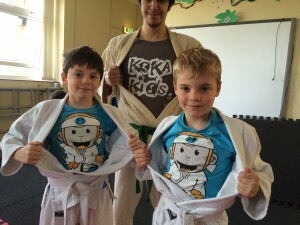 A happy judoka wins their Koka Kids prize! Uses the Magazine to Break down nervous barriers. Former GB International Kerry Tansey has helped club development throughout the North West of England, as part of her role as technical officer for the British Judo Association. Kerry also teaches at her own club, Rainhill Rockets where most of the members are under 12s. 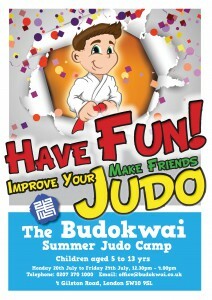 To provide a great judo service where they learn, develop and have fun. John Law is busy rebuilding the Mei-Do-Kan Judo club that his dad, Mr John Law Snr orginally opened in 1980. It’s a small club, with around 30 members at the moment which is looking to grow. Robin Sandler keeps the kids at Sandbach inspired inviting the best fighters in the country to come along to meet them. 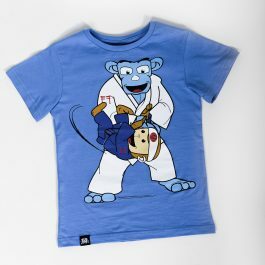 He believes junior judo need heroes. Recent visits include Commonwealth Champion Owen Livesey and Olympic bronze medallist Karina Bryant. It’s also a club very much about family time – and Mum, Dad and the kids are all encouraged to take part. Our objective every session is to get people moving, learning, stretching themselves. I want everyone to leave every session tired, empowered and with the most important thing – a smile! Andy Parton is about bringing judo to everyone. Miramar is an alternative to the high pressure sporting world, looking to build respect around being postive, hardworking and not necessarily about being the best. Although competition is encouraged also for those who want to pursue that path. We are trying to offer an alternative to the high pressure sporting world that puts so many youngsters of ever excelling in sport for fear of failure. We encourage competition for those that wish to pursue that path but also understand that that arena is too daunting for some. Coach Ron Field using the Koka Kids Pop Up Gokyo Banner – a visual so all his judoka can see the techniques.